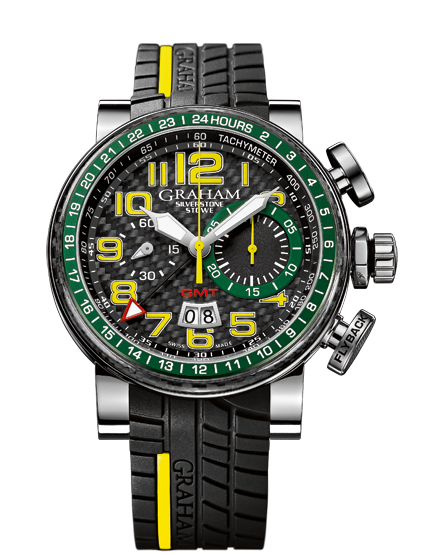 The Graham Silverstone Stowe GMT chronograph. The unique timepiece pays tribute to the golden age of car racing and its valorous spirit. A limited series of 500, the Silverstone Stowe GMT is on the road of legends. No tie, no dinner jacket, no limousine. Today’s dress code is yellow and green. Gentlemen, please put your racing suit on, jump in your car and line up on the grid and start your engines. Once the pistol fires, your eyes will witness true performance. The Silverstone Stowe GMT carries powerful connotations to the race. GRAHAM has developed a true wrist machine which carries impeccable control and state-of-art technology. The Silverstone Stowe GMT is an impressive 48 mm steel chronograph which features carbon elements. The sporty black carbon dial is adorned with yellow numerals, chrono and minutes counter’s hands. The watch also shows a double-disc date and a GMT function displayed by the central GMT hand and the green scale on the aluminium and carbon fiber bezel. The Silverstone Stowe GMT also offers a sophisticated flyback function. It enables the user to reset the chronograph to zero without stopping it. After releasing the flyback pusher, the second hand will restart immediately from zero. The flyback function allows the user to start retiming quickly within one push of a button. It was originally used by pilots. The racing suit would not be complete without a special tyre tread strap. The yellow inset on the strap repeats the dial motto of the Silverstone Stowe. This watch knows all about endurance and will undoubtedly finish on the podium. 48 mm steel case, calibre G1721, automatic chronograph, 28 jewels, 28’800 A/h (4Hz), Incabloc shock absorber, 48 hours power reserve, domed sapphire crystal with anti-reflective coating on both faces, see-through sapphire case back with limited edition serial number engraved, integrated black tyre tread rubber with yellow inset, available on steel bracelet. All of the information on this site - Chronometers.org is protected by copyright. All image and text are the property of Chronometers.org and the companies who have provided them.